Weight : 7-10 kg, but up to 12 and more with fat reserves. Up to 25-30 years in wild. Up to 60-70 years in captivity. 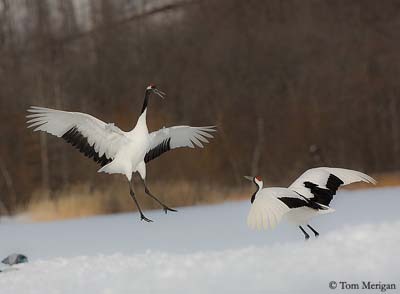 Red-crowned Crane is also called Japanese Crane or Manchurian Crane. 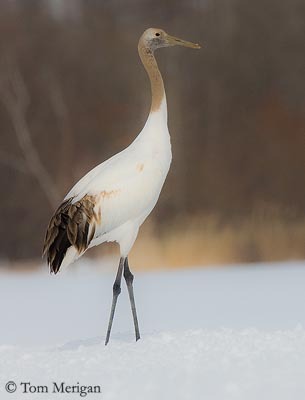 This species has white primaries that is unique in cranes. It is the second rarest crane in the world. Adult has pure white plumage, contrasting strongly with the black secondary feathers. The rounded tail is white. The long neck, chin, cheeks and forehead are black. Ear coverts and nape are white. We can see a red patch of bare skin on the crown. This patch may become brighter when the bird is excited. Underparts are pure white. Underwing shows blackish secondary feathers. The long bill is horn-coloured. Eyes are brown. Long legs and feet are black. Both sexes are similar, with male slightly larger than female. Juvenile resembles adults but it has tipped-black primaries. The secondaries are brownish. Neck and head are dull brown or greyish. It lacks the red crown. It reaches its sexual maturity at 3-4 years. 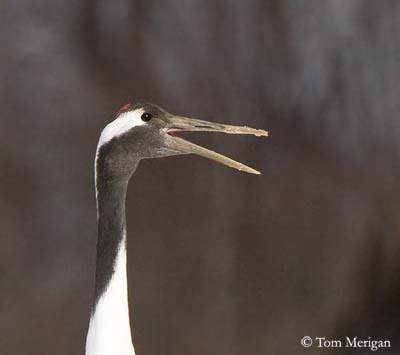 Red-crowned Crane utters penetrating vocalizations. It has wide repertoire from low-pitched purrs to loud calls given by both mates during the courtship displays. Unison calls are given by both sexes before the dances. Red-crowned Crane is the most aquatic of the cranes and prefers deep waters. This species lives in open marshes with reeds and sedges, and in wet meadows providing a good visibility. It winters at rivers, ricefields, freshwater marshes and coastal salt-marshes and mudflats. 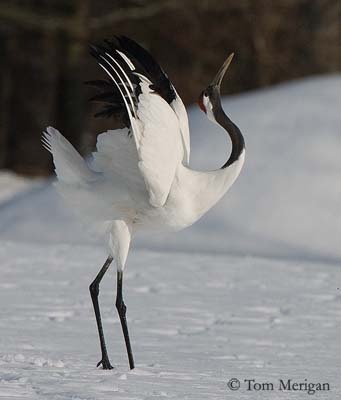 Red-crowned Crane is resident on Hokkaido (Japan), but this species also breeds in NE China and adjacent SE Russia. It winters in Korea and Jiangsu, CE China. 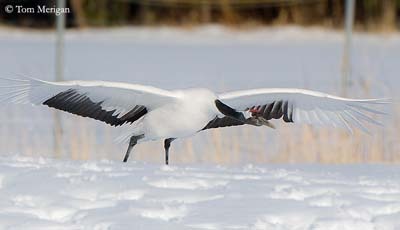 Red-crowned Crane usually forages in deep water marshes. It feeds on insects, aquatic invertebrates, amphibians, fish and rodents. It also consumes plant items and grains during winter. 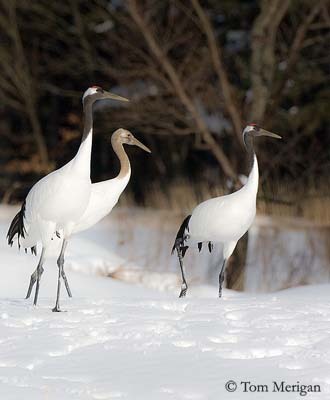 On Hokkaido, the cranes use feeding stations in winter. 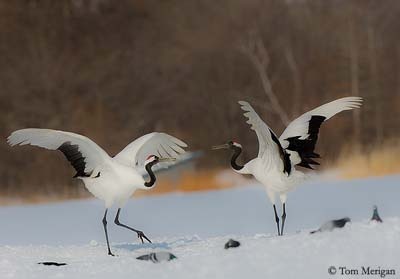 Red-crowned Crane feeds by walking and pecking. The long toes allow the bird to walk in soft muddy soil, and the long bill is used to probe into water for preys. These cranes are gregarious and live in flocks. 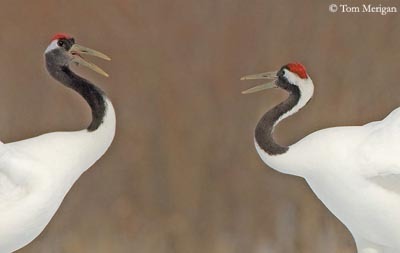 Red-crowned Cranes have long pair-bonds, and the birds return regularly to the same nesting-site every year. Cranes are well known for their wonderful mating dances. These dances include jerky bouncing, graceful leaping up in the air and wild running with outstretched wings. The birds bow with bent legs and raised wings, and jump. They may take a stick or some vegetation, and toss it up in the air. These dances are amazing to see. They are used for pair-bond maintenance, but they have several goals according to the age of the bird. Even the chicks may dance and for them, these displays are associated to play, whereas in adults, they are a real communication accompanied by calls. Vocal displays occur, with head tossed backwards, bill upwards and raised wings. 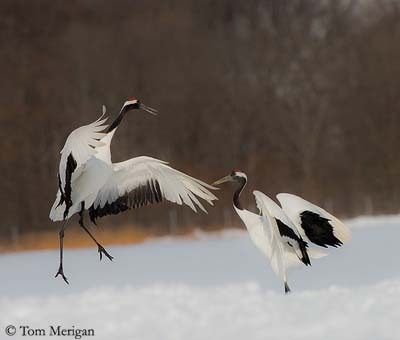 Red-crowned Cranes are resident on Hokkaido, only performing short distance dispersions after breeding season. 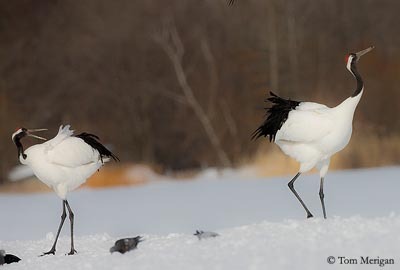 Other populations migrate in winter to the marshes of China, Japan and Korean Peninsula. 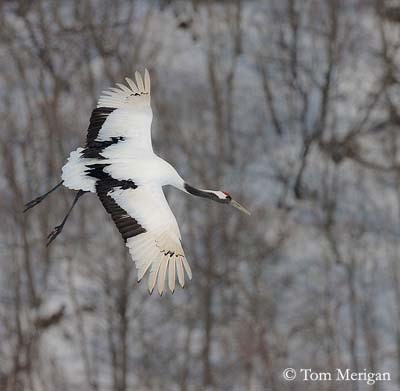 Red-crowned Crane performs powerful flight thanks to its large wings. It takes flight first by running on the ground while it beats the wings. It reaches a good speed very quickly and can take off with a push of the large wings. 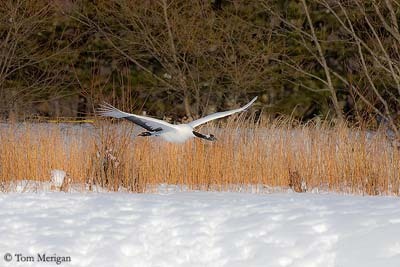 In flight, the neck is stretched straight forwards and long legs are trailing behind the body. 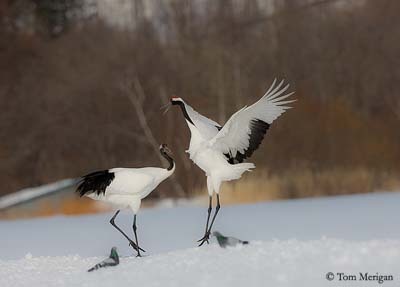 Red-crowned Crane, as other cranes’ species, is monogamous and pair-bonds are for life. They strengthen them by their beautiful dance displays. Breeding season occurs in spring. 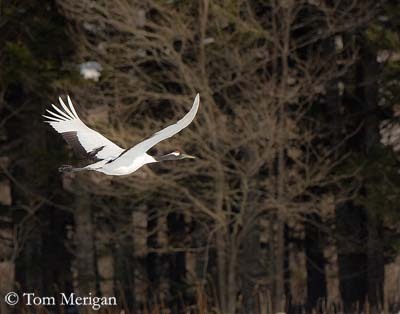 Red-crowned Crane breeds in wetlands, mainly in the coastal marshes with dead standing reeds. The nest is situated in fairly deep water, about 50 cm depth. It is made with reeds and grass, and built by both mates. It is a platform with sometimes a moat of water around the nest. Female usually lays 2 eggs. Incubation lasts between 29 to 34 days, shared by both adults. Female incubates at night, and both take turns at nest during the day. At hatching, the chicks are brown with some white spots. They are precocial and leave the nest very soon, a few days after hatching. They follow their parents when foraging. They fledge at three months. This species usually produces one brood per year. 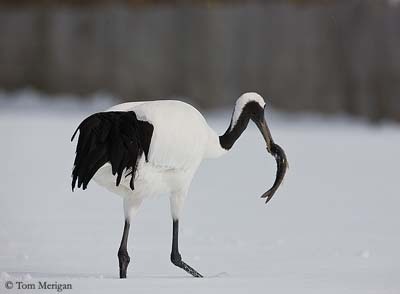 Red-crowned Crane is almost omnivorous, feeding on wide variety of food items, according to the location. It feeds on insects and aquatic invertebrates, fish, amphibians and small rodents. But it also feeds on plant matter such as reeds, grasses, rice, grains and seeds during winter. 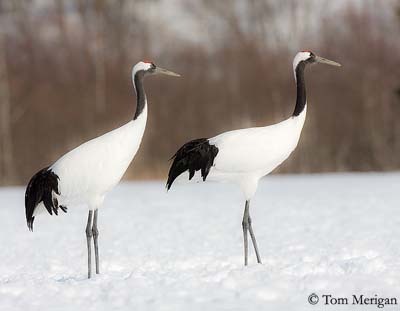 Red-crowned Crane is classified as ENDANGERED SPECIES, with small numbers of birds. The main population lives in China. Thanks to the feeding stations on Hokkaido, populations have increased. But the degradation of the habitat with drainage of wetlands for agriculture and industry is the most important threat for this species. Breeding programs with captive birds are active, and several captive raised birds have been released at natural breeding sites. Red-crowned Crane appears in myths and legends in Japan and China, where this bird is the symbol of longevity and immortality.